Cooler temperatures at dinner time can inspire me to get going on my fall weather cooking menu and to start with I can check off items from the freezer to get going on. There were two packages of boneless country pork ribs in the freezer and one package is enough for the two of us and then enough for a work lunch or dinner for Michael. 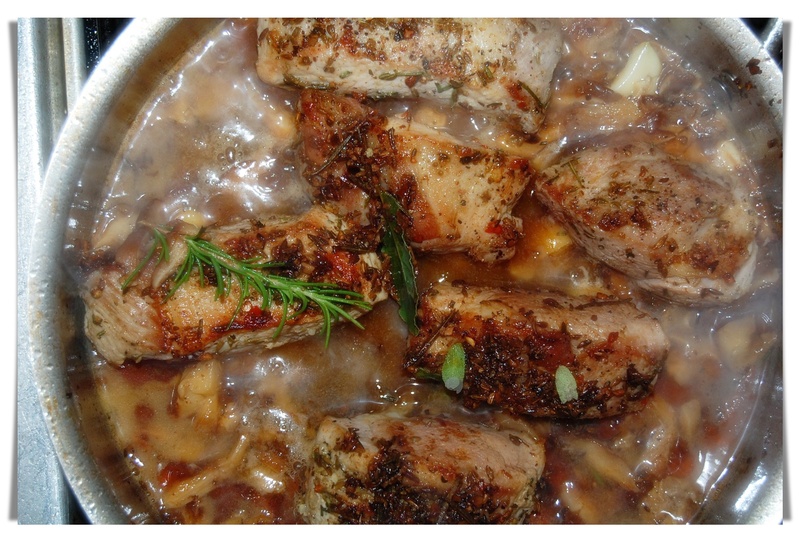 As I poured two bags of fennel seed into a storage container the aroma made me think of a Tuscan roasted hunk of pork, but way to much for two so I adapted my recipe to work with the 1+1/2 pounds of the country ribs. For the spice blend rub/marinade I measured out and placed on a clean board 1 tablespoon fennel seeds, 5 cloves of garlic, a good amount of freshly ground pepper melange, 2 teaspoons coarse Kosher salt and chopped it all together, patted over dry and EVOO coated ribs. 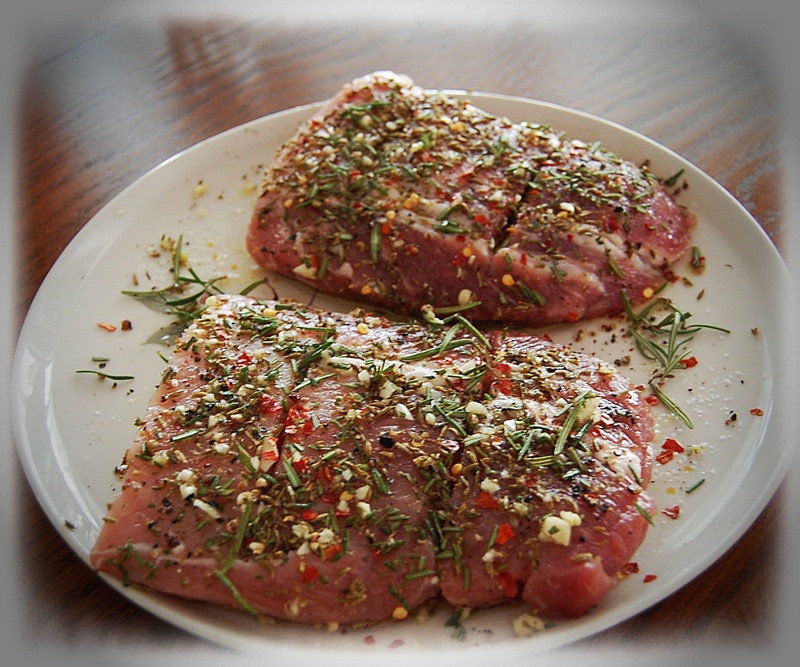 Finally chop a tablespoon of fresh rosemary and scatter over the pork…wrap and refrigerate for 6 hours or even over night. Heat a ovenproof skillet (it will need a lid) add 1+1/2 tablespoons EVOO and brown the ribs on all sides, removed browned ribs to plate and deglaze the pan with 1/2 cup white wine. Pour the pan sauce over ribs, wipe the skillet out if it has black bits in it, but otherwise the lovely brown bits will add flavor to the sauce. To the pan add a tablespoon of unsalted butter, melt and toss in 8 ounces assorted sliced mushrooms and try to get them to a bit of a crispy golden color. 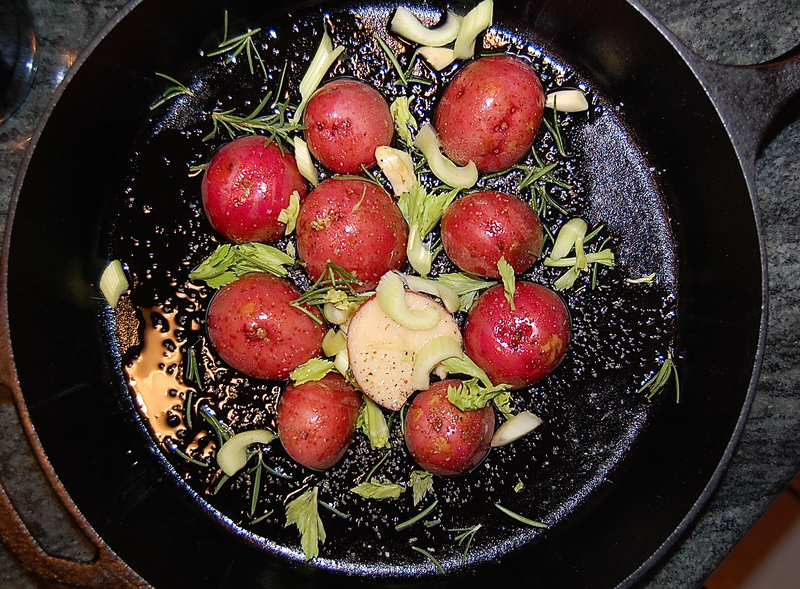 Splash in a cup of dry white wine, get it bubbling, add two fresh sage leaves, 1 bay leaf, two smashed cloves of garlic and a small sprig of rosemary (about 1 inch). Add the ribs back to the pan, cover with a crumpled piece of parchment paper tucked around the braise cover, braise for 45 minutes in a preheated oven and test for tenderness at 45 minutes, cook for another 15 to 20 minutes. I checked the liquid level at 45 minutes and the braise needed more liquid, broth or white wine is acceptable. After a total 1 hour the meat is fall apart tender and perfect for dinner on a rainy night.